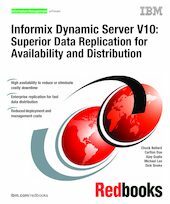 This book provides an overview of the high availability and enterprise replication features of Informix Dynamic Server (IDS) Version 10, which can simplify and automate enterprise database deployment. Version 10 offers patent-pending technology that virtually eliminates downtime and automates many of the tasks associated with deploying mission-critical enterprise systems. The high availability capability can reduce or eliminate costly downtime through, as examples, the introduction of online index rebuild, the capability to create and drop indexes online without locking tables, and point-in-time table-level restore. Enhanced enterprise replication provides solutions for those customers requiring reliable and quick dissemination of data across a global organization. The replicated data can also participate in the high availability environment with capabilities such as seamless online resynchronization of enterprise replication nodes at startup, for example. There is also enhanced capability for high-availability disaster recovery customers in the form of the ability to resend primary server indexes to HDR secondary servers without requiring a rebuild of the index on the primary server. These significant and powerful capabilities can enable you to intelligently replicate (distribute) your enterprise data to improve the availability of that data to better service the requirements of your enterprise.